A relaxed approach, with structure, at her Arden studio near Wilmington, Delaware, just 30 minutes south of Philadelphia, Pennsylvania. Judith Kay helps students from ages 8 to 80 play the guitar and sing the music that they want to do. She encourages them to develop strong musicianship skills and learn music theory, so that eventually they can become their own teachers. The semi-annual Repertoire Class gives students a chance to meet, hear and learn from each other and special guest artists. Everyone loves it! Judith Kay is an expert in teaching jazz inversions, chord‑melody playing, and authentic bossa nova rhythms. "I had the pleasure and privilege of studying with her from age 9 to 17. Judith Kay combines the best of all worlds in her teaching. She makes sure to provide a solid foundation of musical skills . . . . Her lessons are a seamless combination of education and fun. Thanks in large part to Judy, I went on to become a professional musician. She was and is an excellent teacher and role model for me." "Judith Kay has a vast musical knowledge and extensive experience as a performing artist. These qualities, combined with a willingness to adapt to each individual's musical interest, make her ideally suited to help guitarists of all ages and levels of ability." "Judith Kay clearly enjoys both performing and teaching music. For beginners, she is most encouraging; for more advanced students, she is demanding without being intimidating. 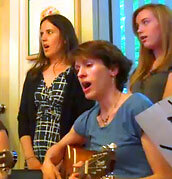 Since studying with Judith, I have dramatically improved both in voice and guitar." "I studied with her five years, from age 13 to 18. Judith comes up with fantastic ways to help you learn. She is energetic and funny! She's open to many different kinds of music. I am proud to call Judith Kay my guitar teacher and friend." "Come to this place and learn the JK way."